In a year where the big names of college football have not individually distinguished themselves (though Tebow and McCoy's teams certainly have), there's a multi-threat speed demon coming on even faster than his team is. I thought I saw it all when C.J. Spiller ran, caught, returned, and ran some more on his way to a Clemson record 310 all-purpose yards two Saturdays ago in a thrilling 40-37 overtime win in Maimi. But he wasn't done. Last night against Florida State he bested his own brand-new school mark with 312 in a 40-24 win over Florida State, sending Death Valley into a frenzy. If there has been any knock on Spiller, it's that he's not an every-down back. That didn't seem to bother Reggie Bush supporters, whose numbers Spiller's compare very favorably to. But in his most recent tour-de-force, Spiller carried 22 times for 165, with a lot of hard yards late in the 2nd Half. Spiller and teammate Jacoby Ford work year-round for Tiger athletics, running indoor and outdoor track for Clemson. Ford is the NCAA Champ in the 60m. 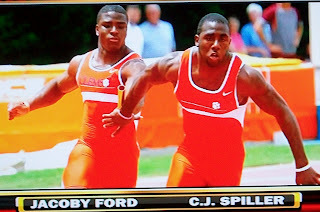 And Spiller is the anchor on Clemson's 4x100 relay team. Come to think of it 100 meters doesn't seem like too much ground to cover for a big-time return guy. Try 6 career kick return TDs. Spiller is the most exciting player in college football, and Clemson with their team speed, pass rush, secondary play, and surprising poise from frosh QB Kyle Parker may well be a rematch vs Georgia Tech away from an ACC Championship and BCS bid. Then expect to see Spiller in New York. And expect him to bring home the hardware. Go ahead, name a better candidate to run against him.